How big is the Hardware? Will we finally see how it hooked up with 4 games? Very likely as part of Exa Arcadia's Launch announcement extravaganza with more than 20 parts confirmed. Only 1 week left until Exa Arcadia makes BIG ANNOUNCEMENTS!!! While we wait for a week, I wonder what you guys think the games and other surprises could be revealed? Would feature new ways for operators to earn income beyond coins such as in-game-advertisements in seamless ways, cross-promotion tricks that allow revenue to be shared to the operator from the influencer, etcetera. Demonstration of the Exa Arcadia mobile companion application to set up player profiles with easy game location tracking. An optional attachment that allows QR codes to be scanned from Exa Arcadia companion app for more features, like save character progress and setups, copy replay data to be uploaded to Twitch. It is fun to speculate on what could those 20 announcements be at JAEPO 2019. Will the announcements be live-streamed at the conference? I do not like to post again, but I am happy that Exa Arcadia will do live-streaming at JAEPO throughout the weekend!!! Tune into Exa Arcadia's Twitch page to check out the upcoming games with exclusive content in action! 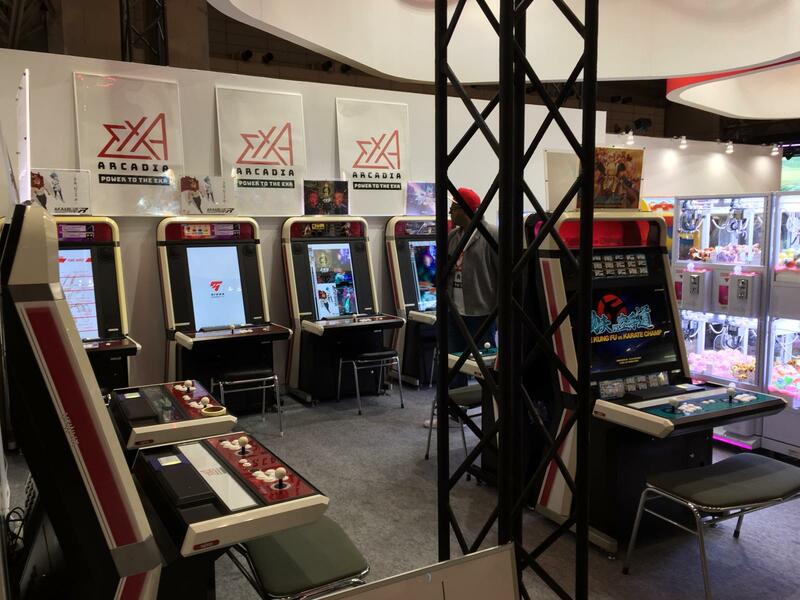 "[Notice] The jaepo2019 will exhibit Exa at the Safari Games booth. Exhibition title ACA and blue Type R Super Hydler ac Infinos exa kung Fu vs Karate star Frost Steel machine Strania ex Nippon Marathon Turbo axial Exa culinary Soul running Red Purgatory continued"
Oh man, the new Windjammers 2 would be a fantastic addition to EXA now that I come to think about it. First, a quick look at the appearance of the hardware. It seems to be quite compact. At the moment we don't know if this is the final hardware appearance or a specific version. An Exa promotional poster shows a black box with similar dimensions. Tatsujin is the IP holder of all the old Toaplan titles, which is a huge get for the Exa. Tatsujin's boss is infamous for being particularly hard to deal with, and uninterested in letting anyone touch the old IP's. Exa Arcadia also has a much more significant title lineup this year, with more space on the event floor. Aka to Blue's new start screen, which is also the same image as the poster, looks pretty cool. Wow. That is amazing and unexpected at the same time! 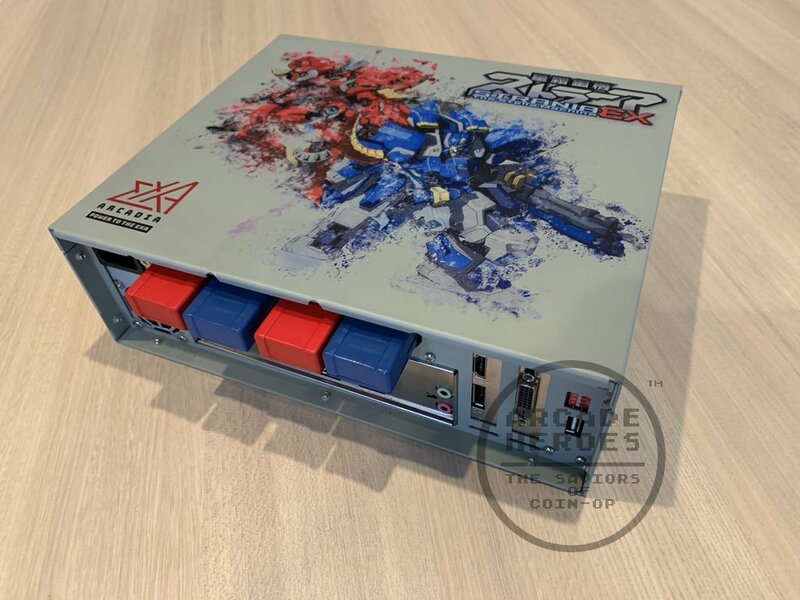 You should also notice from the previous pictures is that several cabinets have game select screen whenever there are 2 - 4 games inserted into the motherboard, complete with attract videos and small icons on the corner showcasing games displayed. Also you can see those blue-boxed devices with "EXA Arcadia" labels written into them. I wonder what are their purposes? Do they scan cards / mobile phones? Only ShouTime and crew will tell. OMG please let Natsume make one of their fighting games!!! For some weird reason, Danmaku Unlimited 3 Valkyrie has been changed to Akyrios EXA. That names seems to be more confusing if it is not re-skinned beyond the looks of Danmaku Unlimited 3. Valkyrius EXA probably is the actual game (DU3 Valkyrie) other than Aka to Blue in vertical danmaku games, which the name Akyrios EXA is a typo from the video reel. I pointed out the error to Exa Arcadia and Arcade Heroes. Anyways, make sure to stay alert for the upcoming game stream from Exa Arcadia at Twitch 10AM Japan time (1AM UST, 5PM PST). Last edited by MrJBRPG on Sat Jan 26, 2019 2:22 am, edited 1 time in total. Exa Arcadia has begun Livestream! Do not miss out! Probably starts at 12 noon Japan Time. New announcements, game demos, and more! Can anybody translate the schedule form the tweet below? Are "We are waiting for the contact of companies interested" (specifically regarding the old IPs) and "We will assist you in game production" incorrect translations? Does this mean they only want publishers/distribution and not development? 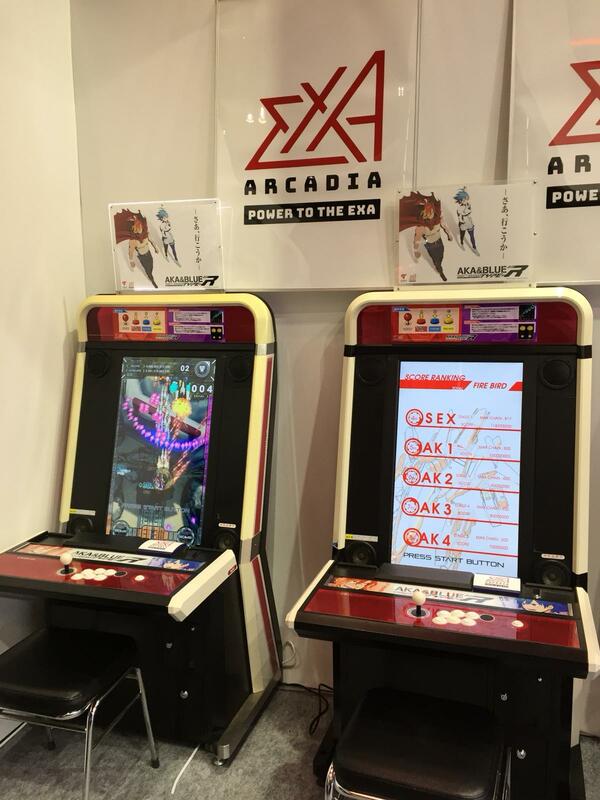 Exa Arcadia hardware looking nice, I'd love to play on one of those cabs someday. Vritra Hexa, from the stream. I didn't even realise this was coming to Exa, I used to have a version of Vritra on my phone. It was pretty good. "We are waiting for the contact of companies interested"
This isn't how business development is accomplished in other industries but maybe so in the arcade industry? The first livestream marathon has left quite a good lineup, along with more shooting games for us fans like Psyviar Delta (EXA), Rival Megagun XE, and VriTra Hexa, all 2 player simultaneous; there were also some new diverse surprises as well such as Axel City 2 with tried and true fighter tropes, Blazing Chrome (EXA), and prototype game "Gimmick!" with slick and twitchy platforming controls. Sunday's livestream should pull out bigger guns! Any price for the mobo yet? Game List from Elixir shmups twitter. I hope it is under 1k and the games are reasonable. I will be jumping in if that is the case. WOW, they are rereleasing daraku tenshi?! will it be a remake or just a port? Also, the Exa Arcadia website should be renovated to reflect more on the three color brand (white, black, and red) as well as the confirmed games / developers on the list along with hopefully a blog section that gives more details on upcoming news related to the hardware and catalog along with possible spotlights such as developer interviews, arcade locations, etc. Eric Chung: We have not really announced a price yet, but you can expect one kit, motherboard plus game, to cost around US$2000. There's a point about the pricing that one must consider (I'll ignore the objective quality of the games for a moment). As far as I understood, exA wants to go back to the revenue model that existed before the current revenue splits. That means, with the price of the game the operator pays for the right to rent that thing out. (That's something you cannot do with regular $20 games, for good reason). A buyout, so to speak. Current arcade blackboxes require you to pay a percentage of each coin to the manufacturer, plus the initial investment. So asking a couple of hundred bucks for a game makes sense. I'm more interested in the range of individual game prices. I can handle a one-time hit to get the motherboard if the games aren't going to be $500 each, though I understand why they could be.